I’m giving myself (and you) a break after pigs and worms. I’m going to talk about my handsome black cat. This post may not appeal to anyone except other cat lovers, but please indulge me, and let me brag on him. Several posts ago, I showed him sitting quietly sitting at the front door watching the world go by. This time, I’ll give him the entire show. His name is Kaimana, which means “diamond” in Hawai`ian. 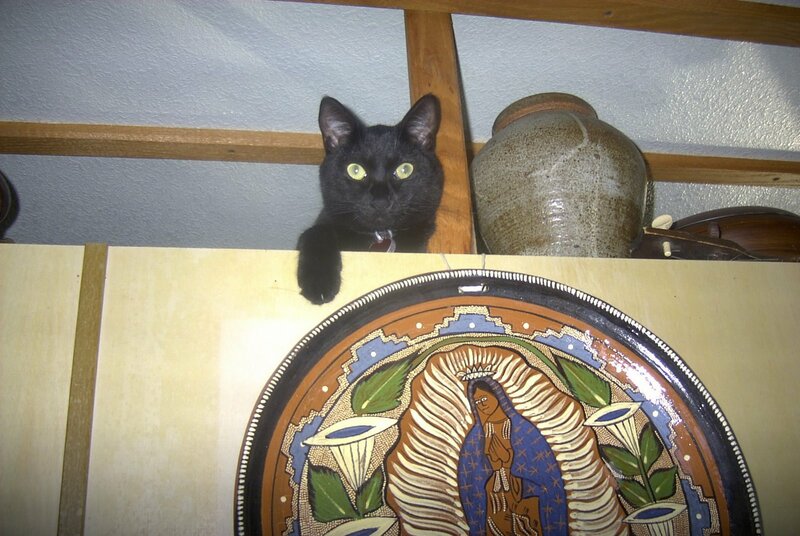 He is totally black except for a tiny white spot under his chin – his diamond. He has never known a stranger, and unlike many cats, he has to be the center of attention at all parties. He never runs to hide when people come over. He loves everyone, and everyone loves him. 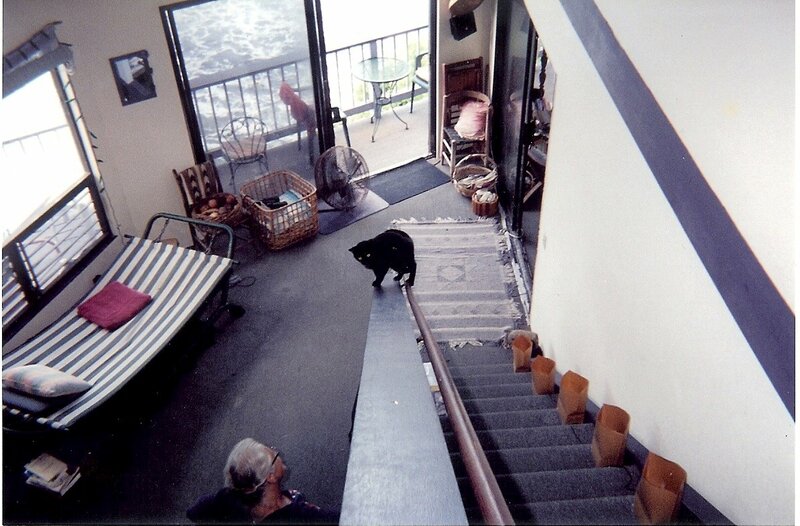 When I lived on the ocean down on Alii Drive in Kona, in his more playful and brave kitten years, he loved to walk up the flat railing to the loft. He couldn’t get all the way to the top at first, but he kept trying until he made it. 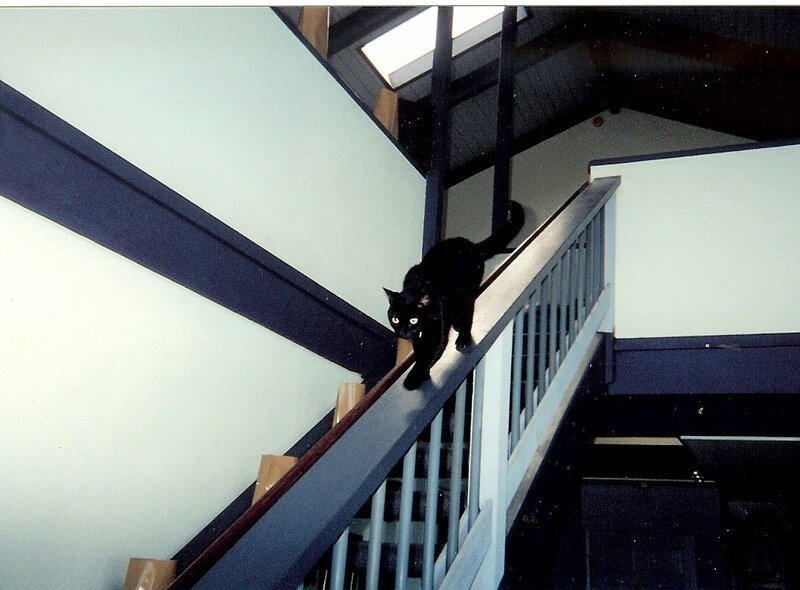 Once he learned how to get to the top, he would spend his time walking up and back down – over and over. Like most cats, he has an insatiable curiosity. He will find the strangest place to investigate and/or hide from me. 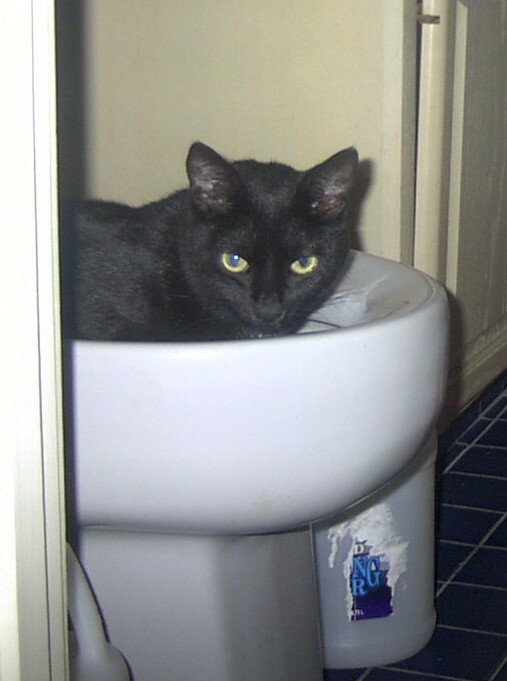 One of his favorite was the cool bidet. 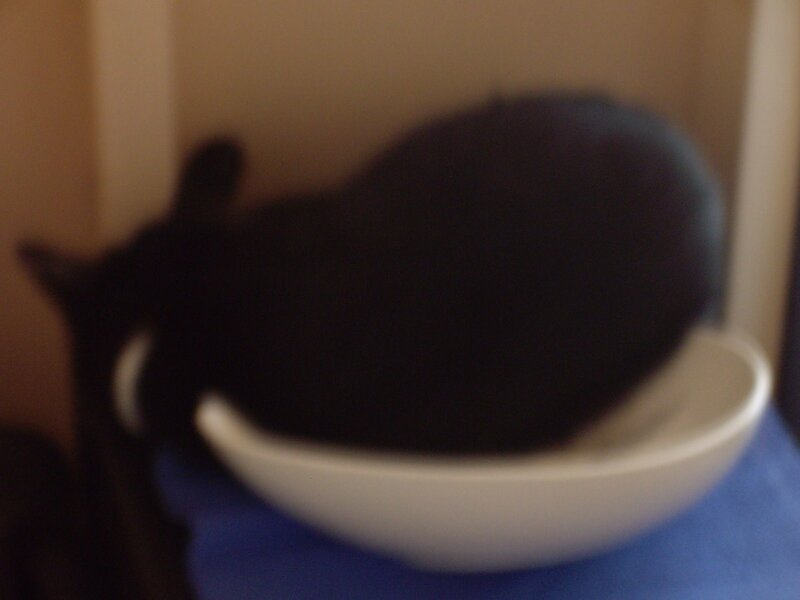 Sometimes he will sleep in a cool white bowl (sorry for the fuzzy shot). 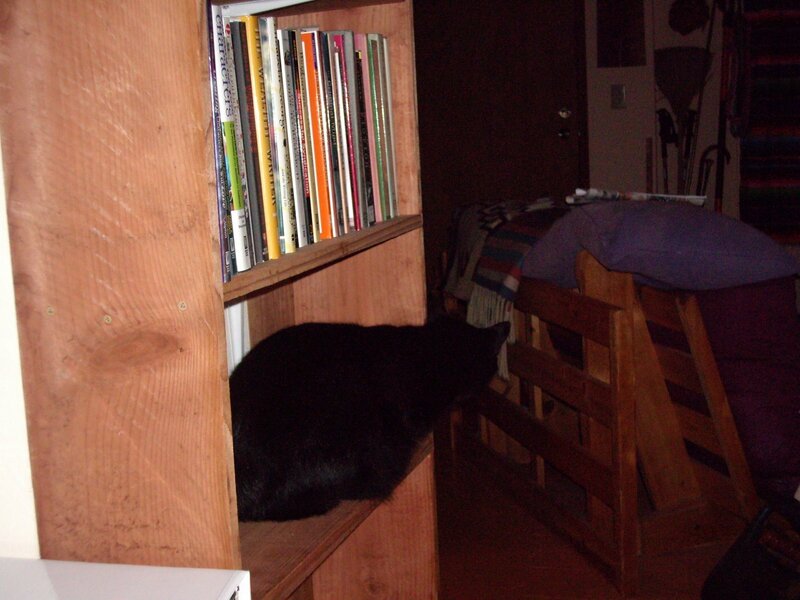 A true bookworm, he explored my bookshelf as it was being built and before I’d filled it up with books. 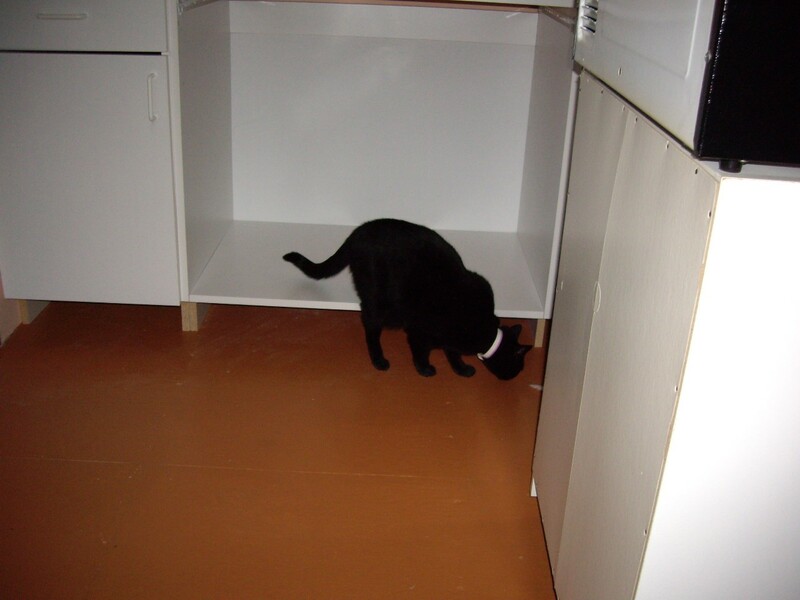 As the kitchen cupboards were being built, he had to check them out, too. A special wide shelf was built for him by the kitchen table so he could perch himself in the window and survey his kingdom. Being a (neutered) male cat, no matter how careful I was, he had several bouts of urinary tract infections that put him in the hospital. I think he never quite got over it. The last time he came back from being hospitalized, he acted as if he’d had a stroke. He was addled and didn’t seem to know where he was. I went online and found out about “kitty altzheimers,” which didn’t help my concern at all. He would sit and stare blankly into space. He couldn’t find his food in the normal spot and he acted totally disoriented. He was able to find his litter box for one bodily function, but he began to pee just anywhere he happened to be. 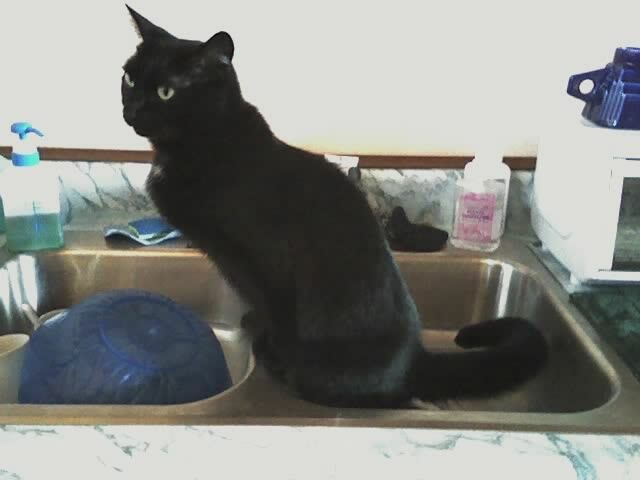 His favorite spot became the sink, and I had to start covering it up so he wouldn’t go there. 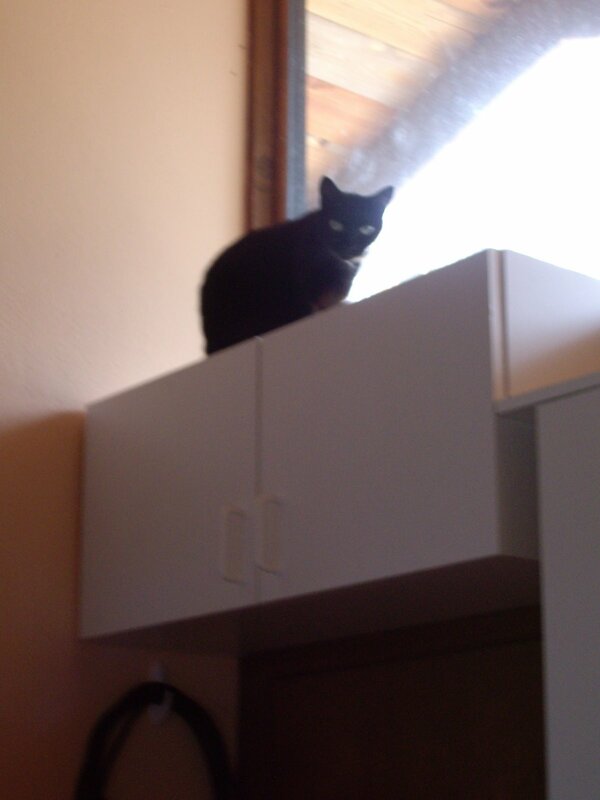 He had always loved high places, but now he wouldn’t even walk on the floor, but jump from table to counter, to washer and onto a shelf. If he couldn’t avoid being on the floor, he’d jump around on it quickly to get wherever he was going. He was knocking things around and making a place for himself. It was very odd behavior, even for Kaimana. 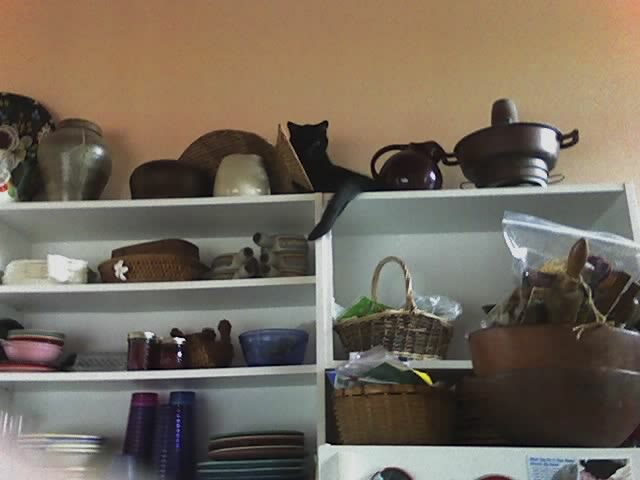 Then he found a way to get onto an even higher shelf. 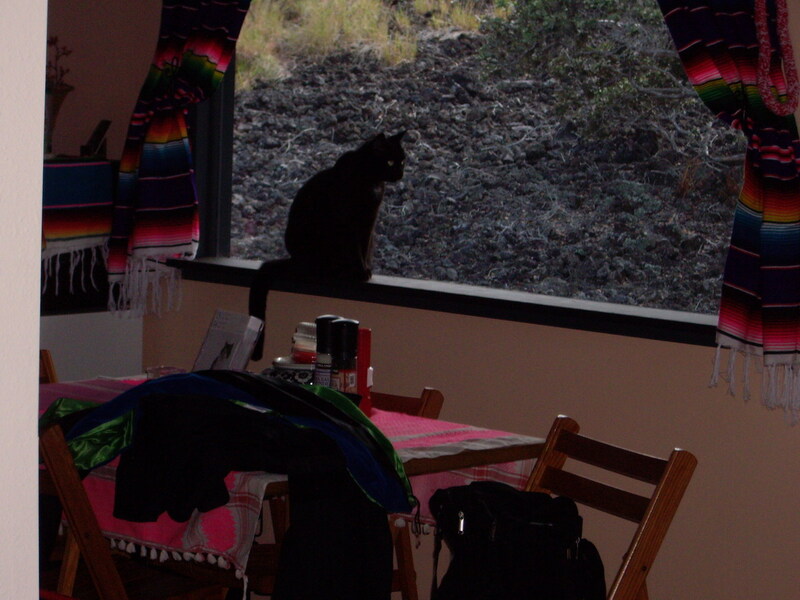 He slept in that far corner, watched the world from the window there, and came down only to eat. It was when he started peeing off that top shelf onto the stove and floor that I knew something had to be done. He is getting old and senile, so I briefly considered having him put to sleep. But he’s been with me too long and I wasn’t quite ready to do that. My brother said he would rather someone put him outside if he got to that point, so I gently set Kaimana outside and that’s where he lives now. 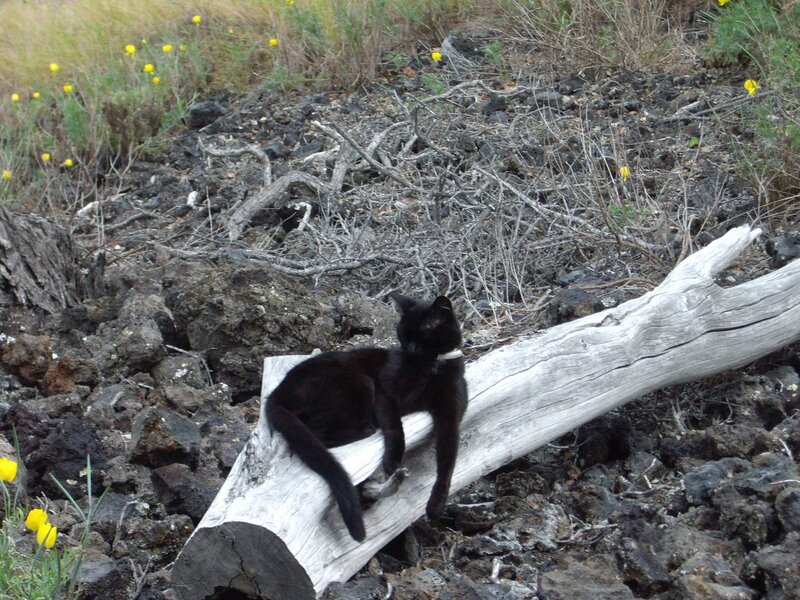 He never liked walking over the lava much, and whenever he got out in the past, he would come back in with raw paws. He still walks over it slowly and carefully. He sticks close to the house and seems to feel freer to do what he wants. He lounges around, sniffs the flowers, stays close by me when I feed the chickens or water my garden area, and we talk to each other. I told one of my daughters what I’d done and said that someday I’d be old and incontinent, too, and that she’d have to take care of me. Her response was that it would be fine as long as I didn’t pee on the stove. 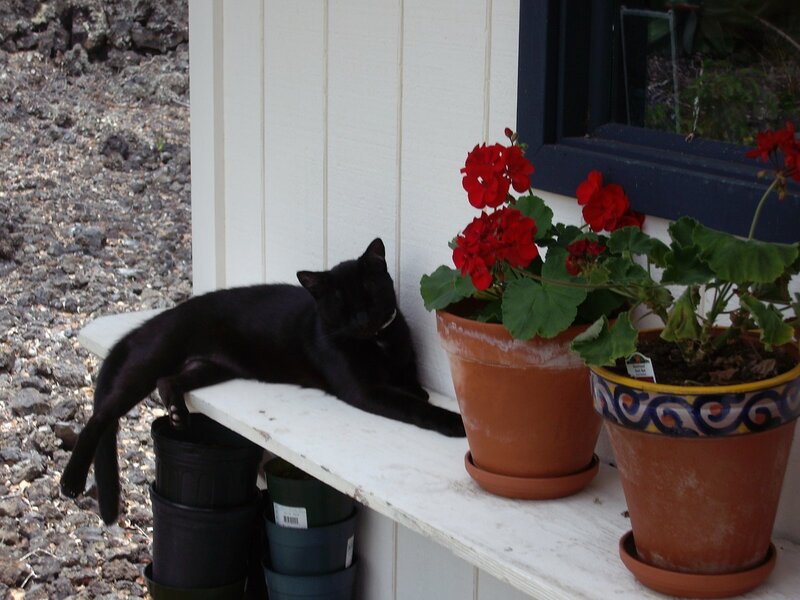 His favorite spot seems to be on the shelf with my geraniums. From here he can watch me at work in the kitchen – and know when I’m coming out to feed him. I think he’ll live a long and contented life outside. For a indoor cat that has been pampered all his life, Kaimana makes a good farm cat.